It’s time to get your streak on. How will you Streak for Pediatric Stroke? Pediatric Stroke Survivors often have multiple disabilities. If these little stroke survivors can do some of the hard things they do every single day of their lives, then we can do something to honor them. Help CHASA continue helping families while you increase awareness. How do I Streak for Pediatric Stroke? 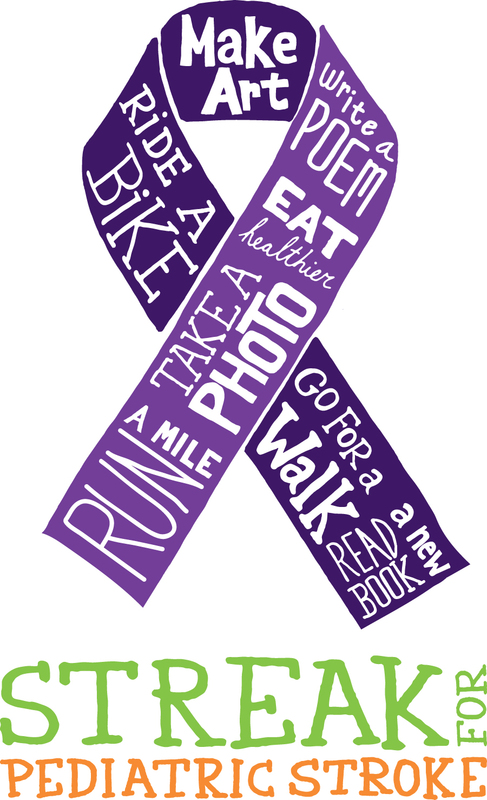 Set up your Streak for Pediatric Stroke Awareness Page at Crowdrise. Share your story and ask friends, families, neighbors and whoever else you know, and ask them to donate to CHASA so we can keep helping you and your kids. The world needs to hear about our little stroke survivors. If you’re the friend of a survivor – even better – tell us how they inspire you. What does “streak” mean? It means doing the same thing several times in a row. Kind of like our kids do in therapy. You’ve heard of a “winning streak” in sports – this is where we got the idea. Streak Ideas. You may streak for a few minutes or for the entire month of May. You may have a heath streak, an inspirational streak, or a building awareness streak. Or maybe you want to have an actual STREAK of purple in your hair or on your sidewalk. Check out a few of our 2011 Streak for Pediatric Stroke Awareness Streakers. These are from an older Streak Campaign and we’ve since moved our fundraising/awareness pages to Crowdrise. Art, Blogging, Purple Hair – Lasha is Streaking! Streak for Pediatric Stroke- Team Brody!